In Moscow, one could take a long walk along the banks of the Moskva river, which loops and meanders for over 30 km in the city. An Indian woman in Moscow writes home to share her experiences of life in the Russian capital and her love for life in Russia. There is something about Russia, about Moscow which has thus far been elusive to me. I have tried sporadically to put it in words, never really fully comprehending my own fascination. And then the penny dropped – Russia is the land of the common man, with its communist past contributing toward making it what it is today. For a person like me, who has held on to feudalism and capitalism as conducive to social order and progress, there is a lot of rethinking to do. Perhaps communism shouldn’t be waved off as mere utopian idealism. Let me cite other seemingly isolated incidents – random pieces of a jigsaw which together have completed the picture and contributed to my own understanding of my love for Russia. Another Indian friend lamented: “a city in some ways is defined by its waterfronts. Why doesn’t India develop its river banks?” I have been thinking of this for quite some time now, and the pieces now begin to come together. I have always said that life is great in India. But you need money! Or you need to be not spoilt by a comfortable life to not mind the dirty, unkempt Yamuna waterfront and enjoy it nevertheless. There is a pronounced class divide, with the classes usually not sharing the same spaces with the masses. We live in our beautiful golden cages with an instinctive understanding of which streets are to be stepped upon and which to be avoided, our world “broken up into fragments by narrow domestic walls,” as (Rabindranath) Tagore said. It is so unlike the freedom I feel here, where the world truly is my oyster. 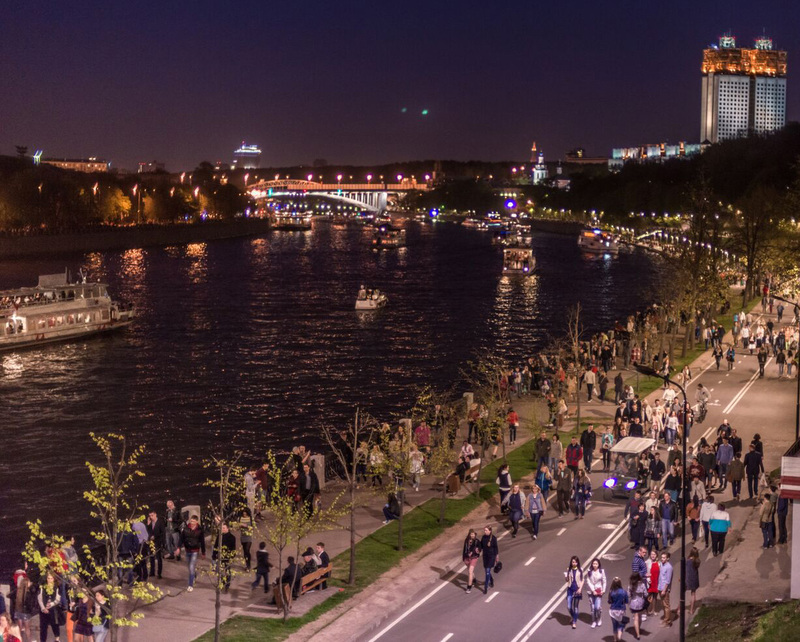 In Moscow, one could take a long walk along the banks of the Moskva river, which loops and meanders for over 30 km in the city. And, if you have money, take a fancy restaurant boat cruise. In effect the moneyed and the less fortunate can potentially enjoy almost similar facilities. The river, clean and beautiful, belongs to all. It never ceases to surprise me that parks and even streets in Russia have apple and pear trees and berries for all to eat. The Soviet value system, that “this land belongs to us,” is so ingrained in the people here, that no one abuses this access. In India, it is common to find Jasmine bushes in public places stripped bare by people collecting the flowers to decorate their house. We may be becoming more individualistic in our approach to life with little respect for the community. Far away from the archives of my childhood days of travel with my father, a memory comes to me– of sweet jamun trees that lined the roads somewhere in Gujarat. But along with the trees, that constitute this memory, I see village women with wicker baskets selling those very jamuns which should have been free for everyone. I distinctly remember my father explaining to me that we were paying for the service as these women had made the effort to climb the trees and gather the berries. You want to feed waterfowl in a lake in India? Well, even if you didn’t originally want to, chances are a street hawker will appear trying to cajole you into buying some duck feed. Could it be that we Indians seek a commercial opportunity in everything? As I walk along the waterfront in Moscow, regretting that I am not carrying food for the birds that eagerly swim toward me, I look around for a hawker, but find none. I realize now that I have been paying for a service all my life which I could have done without. Another fallout of this system is the underlined inequality of a matrix in which I have come to expect service from ‘lesser’ citizens of my own country. This realization saddens my heart. In Russia one often hears criticism of the government and dissatisfaction about the quality of life. It may perhaps be a result of the fact that Russians are given to complaining and animated intellectual/political discussion, reminiscent of Tagore stories set in pre-independence India. Sitting together over mint tea and Russian ‘pirogi’ this weekend, my Russian friends, one of whom was just back from Italy and one from Greece said, after some contemplation, that spending time in other countries made one realize how comfortable life in Russia really was! Metro travel is inexpensive and all have access to the basic amenities of electricity, gas and water. When I compare life in the capital cities of our two countries, I find that while in Delhi, even with temperatures soaring to 47 degrees in summer, access to air-conditioning is a dream for the common man, in Moscow, where winters are harsh, everyone has access to hot bath water and central heating provided by the government. Despite being among the most expensive cities in the world, the government keeps under control prices of onions, potatoes, beetroot and basic ingredients of the Russian kitchen, making them cheaper than they are even in Delhi. Government health clinics are clean and beautiful, and allow for electronic queues, either by token or on the internet. That brings me to the question of drinking water. It is quite common in Moscow to buy drinking water and entire sections in supermarkets are stacked with various brands and sizes of packaged water. But a few days ago, watching local television, I heard an address by some government official urging the people to consume tap water. He said, “Tap water is subjected to strict quality control twice a day because contaminated water could result in an epidemic. However, packaged water can come from dubious sources with quality tests once in ten days at best.” While I myself am not adventurous enough to try it, I was impressed by the confidence of the Russian government in the quality of municipal water. I was at ‘Rublyevskoe,’ famed as the fanciest address in Moscow, yesterday afternoon. The cost of a house here has so many zeroes in dollar terms that I found it quite exhausting to even convert to ruble or rupee. The Rublyevskoe chaussée, perfectly lined with equal sized pine trees, a two floored flower shop displaying ‘expensive kitsch’ arrangements, a dandily dressed boy of about eight smiling down from electronic bill boards announcing admissions to a school, top–end cars and designer shops and imposing houses that are hidden behind 10 feet tall fences. All of a sudden, I found other streets of Moscow quite unkempt in comparison. It took me a while to readjust to my own far less glamorous living quarters. Interestingly, a small ‘public park’ in the area was completely uninspiring perhaps because it probably is only used by chauffeurs to hang out. It reminded me so much of the Indian class divide. But thankfully, only a minuscule percentage of people live on ‘Rublyevskoe’. The majority lives in a Moscow where public parks are massive with artificial lakes and beaches and mini forests and flowering fruit trees and I am happy to be breathing the ‘common’ air here. Such is the life of the common man in this fairytale city of Moscow, with whom the threads of my life have come to be thus intertwined. Will write again soon. Waiting to hear from you at indiangirlmoscow@mail.ru.